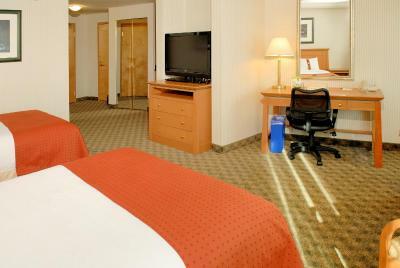 Lock in a great price for Holiday Inn North Vancouver – rated 8.6 by recent guests! Property and location was very good, check in experience was very good, staff in general is friendly. Love the magical entrance of lights and fountains. Super accessible. Super clean, and attractive. Super efficient check in/out. Super comfortable beds. Super great stay! Thanks! Everything was great. Very comfortable bed. Smell really clean. I love it. Will book here again. Staff was friendly and helpful. Accommodation was very comfortable. Staff and food was excellent in The Pantry. The bus stop is right at the gate of the hotel. Very convenient. The entire facility promotes comfort and relaxation. They don't clean the plates. This is a problem, I didn't understand. I would like to know what model of bed we had, there was a sign that said they were new. My husband and I have horrible back trouble, after staying there for 4 days we have so much more mobility. Holiday Inn North Vancouver This rating is a reflection of how the property compares to the industry standard when it comes to price, facilities and services available. It's based on a self-evaluation by the property. Use this rating to help choose your stay! One of our top picks in North Vancouver.Offering an indoor pool, the Holiday Inn North Vancouver is located at the base of the North Shore Mountains, only 15 minutes’ drive from Vancouver city center. Free WiFi is available in all rooms. 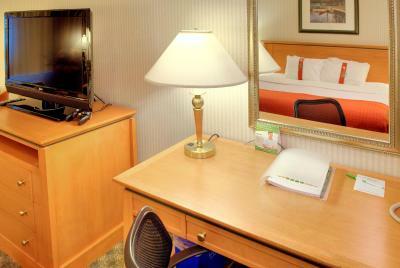 A flat-screen cable TV is included for the guests at the North Vancouver Holiday Inn. A microwave, mini-refrigerator, and coffee maker are included. The Pantry restaurant at the North Vancouver Holiday Inn is open daily for breakfast, lunch and dinner. Guests can also enjoy Seymour's Pub or have a cocktail in Coach House Lounge. Guests can relax at the Blu Harbor Wellness & Spa featuring a hot tub, sauna, and fitness center. A business center and meeting facilities are available. Laundry and dry cleaning are provided on-site. Capilano Suspension Bridge & Park is 10 minutes’ drive from the hotel. Grouse Mountain is 7.5 mi away. 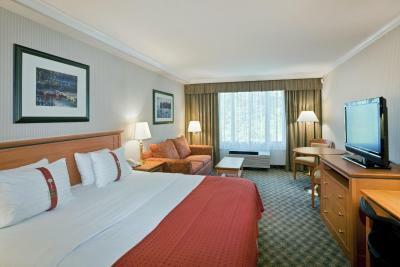 When would you like to stay at Holiday Inn North Vancouver? Featuring 2 flat-screen TVs, this spacious suite offers a separate living room with a sofa bed. A full kitchen includes an oven, stove-top, microwave, and refrigerator. Free WiFi is available. Featuring a 37" flat-screen cable TV, this room offers a sofa seating area and a work desk. A microwave and refrigerator are also provided. Free WiFi is available. Featuring a 37" flat-screen cable TV, this room offers a sofa seating area and a work desk. A microwave and refrigerator are also provided. Free WiFi is available. 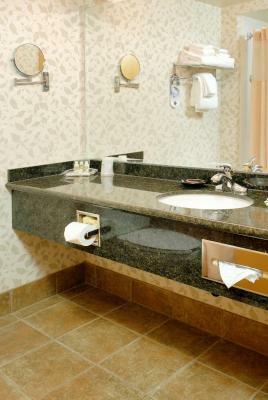 The accessible bathroom includes grab bars, portable bench, raised toilet seat and hand-held shower head. Featuring a 37" flat-screen cable TV, this spacious studio offers a sofa seating area and a work desk. A stove-top, microwave and refrigerator are also provided. Free WiFi is available. Featuring a 37" flat-screen cable TV, this room offers a seating area and a work desk. A microwave and refrigerator are also provided. Free WiFi is available. The accessible bathroom includes grab bars, portable bench, raised toilet seat and hand-held shower head. 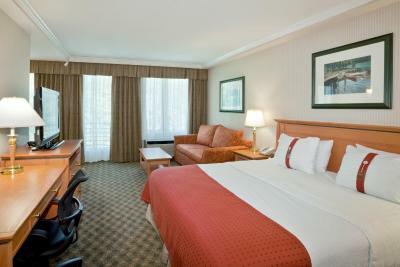 Featuring a 37" flat-screen cable TV, this spacious room offers a sofa seating area and a work desk. A microwave and refrigerator are also provided. Free WiFi is available. Featuring a flat-screen TVs, this suite offers a separate living room with a sofa bed. A full kitchen includes an oven, stove-top, microwave, and refrigerator. Free WiFi is available. House Rules Holiday Inn North Vancouver takes special requests – add in the next step! Holiday Inn North Vancouver accepts these cards and reserves the right to temporarily hold an amount prior to arrival. For any Room Including Breakfast: The rate includes a voucher redeemable for breakfast in the hotel restaurant. Limit CAD20 per room per day. Please note, road closures and construction may impact access to the hotel. Very difficult to access due to location and current road work. Unpleasant man at front desk. Failure to clean bathroom near pool, when informed that the toilet was very Messy. Clean and comfortable rooms. Awesome pool. It’s a bit too expensive ! Was an awesome place to stay! Maid service is not so good cleaning the rooms, the only thing they do is the beds, garbage bags and that’s it, they don’t pay attention to other details. Temperature of the pool was kind of cold, not confortable. The pool was a bit disappointing but the hot tub was more disappointing, it looked like it Haden’s been cleaned in quite some times and it felt sandy on the seats. The beds were comfortable, the staff was friendly, and the fact it had a microwave in the room was really nice. Facility, location, near by area were great. Good place to stay, if you have a car.